I observed the March 29th 2006 total eclipse from Gündogdu on the Mediterranean coast of Turkey, some 50 km east of Antalya. I was here with a group of friends, on a private trip organised by my friend and former colleague Charles Wiles together with his friend and former colleague Ufuk Yilmaz from the Physics Department at Oxford University. Charles and I were PhD students in the Department of Physics and Astronomy at University College London in the early 1990s, working on images of Venus sent back by NASA's Magellan spacecraft. Ufuk's career had included work on sounding rocket payloads and satellites. Others in our group included Charles' father Robert, Neil Clifford from the astrophysics group at Oxford University (and nephew to the DDAS member Graham Ensor), another Oxford Uni chap Kit Rabson, Charles' friend Jamie and his partner Jo, and Chris Jomaron from the UCL days with his partner Jenny. Also joining us was Ufuk's niece Faz, who was reporting on the eclipse for a Turkish-Cypriot newspaper (her article which perfectly captures our motley crew may be read here). Last but not least we had Jem Finer of The Pogues and his wife Marcia. 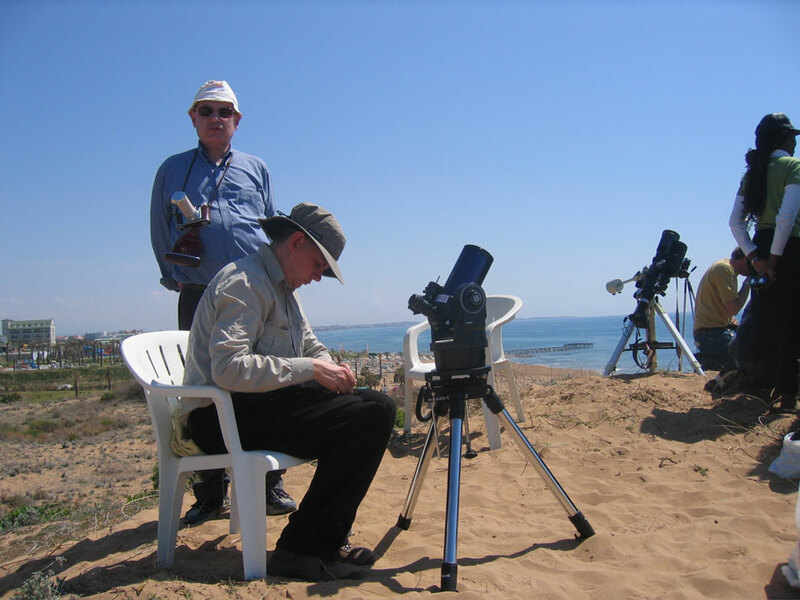 We had a fine location for observing the eclipse atop sand dunes, with the sparkling blue waters of the Mediterranean to one side and the snow capped Taurus mountains on the other. Most importantly the skies had stayed clear for us – this of course had been a major concern! There was a little cirrus during the eclipse but not enough to cause any bother. 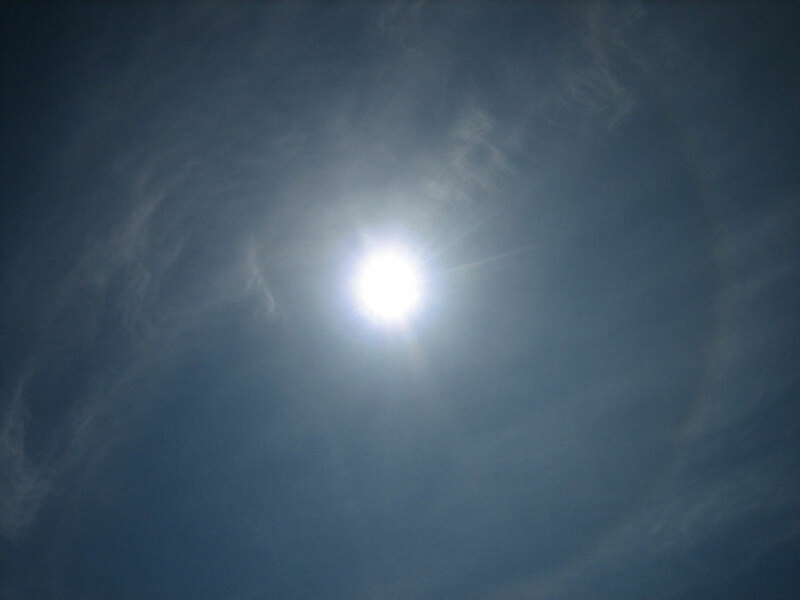 In fact it did cause a rather beautiful 22 degree halo around the Sun about 5-10 minutes before totality! I set up my ETX-90 on its tripod but decided not to align it on the Sun until a half hour before 1st contact, a decision I was soon to regret. Half an hour before first contact (which was due at 12:38 local time) I began training the scope on the Sun. I decided not to bother using the Autostar alignment procedure to set the drive in tracking mode, in an effort to conserve battery power which might ultimately fail me, and electing to use the Autostar keypad to manually keep the Sun in the field of view. I used the BCF screw on solar filter I had used for the transit of Venus in Egypt in 2004 and a 40mm eyepiece. I tried to align the scope on the Sun using the gnomon finder. I did not have any luck as I discovered eventually that the gnomon finder was mis-aligned with the finderscope it was capping! I rectified this and finally got the Sun in the field of view. Unfortunately my mis-preparation had lost me first contact but this did not matter. Indeed the decision to use manual tracking was certainly correct. I spent the next hour or so taking hand held photos via eyepiece projection of the partial phases using the same Olympus Camedia digital camera that I had used in Egypt in 2004 for the Venus transit. A 22 degree halo around the Sun seen through thin cirrus cloud about 5-10 minutes before totality. Picture by Charles Wiles. I was photographing the highest percentage of partial phases in terms of the amount of eclipsed Sun covered that I had ever done before. The light levels dimmed appreciably as the visible sun became a thin crescent. The temperature dropped noticeably and the heat of the day was replaced by a coolness to the air. The light then took on an eerie twilight yellowishness. One could see Venus shining in the sky off to the right from the Sun. However I did not notice or look for any other planets or stars, concentrating as I was this time on the telescopic view. Nevertheless I did notice that shadow edges had a curious fluted appearance by this stage and when I crossed my hands to form ‘pin holes’ there were little crescent suns cast on the sand. I photographed the final sliver of the sun just before second contact. I heard Charles call out second contact was imminent and I looked up at the Sun with the naked eye. A brilliant ‘diamond’ erupted where the remaining sun was and the ‘diamond’ itself was temporarily surrounded by a ring of light. This effect disappeared and the sun had been replaced by the black disk of the Moon surrounded by the pearlescent corona which was brighter and more compact than I had imagined. A truly awesome sight. I took one photo of the eclipsed Sun directly with my camera but it didn't come out too well so I have not included it here! One thing that was noticeable was just how bright the light levels for land and sky were for this eclipse during totality, although on a personal note I am comparing it to an overcast Devon in August 1999! Nevertheless others had noted this too. Another phenomena that we all seemed to miss was the Moon's shadow racing towards us across the sea at 2000 miles an hour. For totality I took the BCF filter off the scope and had a look through the eyepiece. The sight that greeted me was almost certainly the most awesome and thrilling one I have ever experienced in astronomy, barely comparable even to one’s first view of the Moon or Saturn through a scope. The black disk of the moon was surrounded by the intricate wisps and structures of a bright pearlescent corona. I was amazed at the amount of structure one could see in the corona and the stunning quality of the image. Back home I later heard an astronomer on The Sky At Night describe the appearance of the corona as 'spun glass' which was very apt. The corona was also quite bright near the Moon’s limb. Equally amazing and thrilling was the sight of pinkish red prominences shooting out from the limb. I noticed early on that the corona around a major prominence in the 12 o’clock position as I saw it displayed an ‘arcade’ of magnetic field lines. I shot off a whole sequence of pictures of different sections of the limb and corona. I then heard Charles shout out that third contact was imminent and got one final shot of the limb before I did indeed see the sun erupt into view again from the Moon’s limb – I rushed in front of the scope, but missing the second diamond ring visually in the sky. In fact I had seen very little of the eclipsed sun directly with my eye, or the sky and landscape during totality. I did not mind at all – I had seen and captured wonderful things through the telescope! I hastily replaced the BCF solar filter on the scope, knowing full well that for a few seconds the unfiltered thin crescent sun had been flowing through the optics! Oops! I then spent over an hour photographing the partial phases again, up to and capturing the final moments before fourth contact around 15:13 local time. After having been completely clouded out in Devon in 1999 I had finally seen my first total eclipse proper! 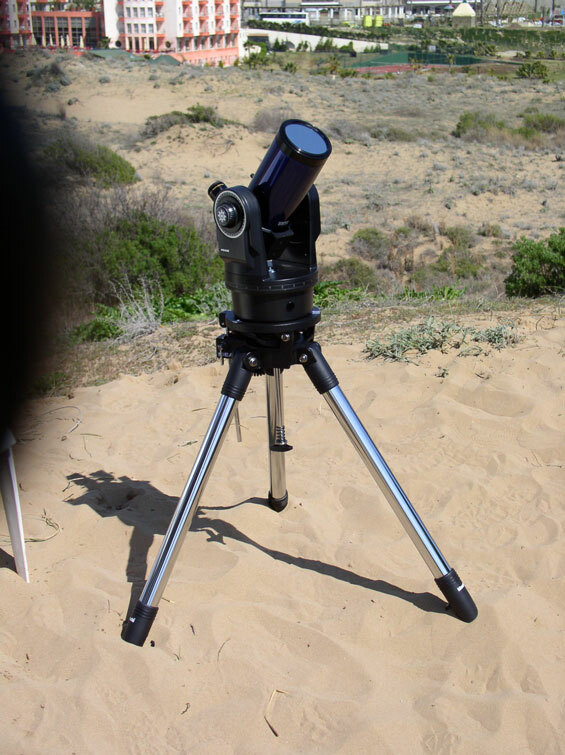 The ETX-90 at the observing site in the dunes above Gündogdü complete with BCF solar filter used for the partial phases. Time for a change of batteries. Ufuk Yilmaz (Department of Physics, University of Oxford) looks on. The town of Side where the NASA Exploratorium had set up to observe the eclipse lies at the tip of the peninsula of land just visible on the horizon between the telescopes. Picture by Jem Finer. Our eclipse watching group. Standing (right to left): Patrick Moore impersonator, Ufuk Yilmaz, Jem Finer, Jamie Driver and his partner Jo, Kit Rabson, Charles' father Robert, four of our Turkish friends, and Chris Jomaron. Crouching (right to left): Charles Wiles, Ufuk's niece Faz, Marcia Finer, and Neil Clifford. Picture by another Turkish friend.